Ultra-marathon runner Sinead Kane claims she has been denied entry into a prestigious race due to her visual impairment. 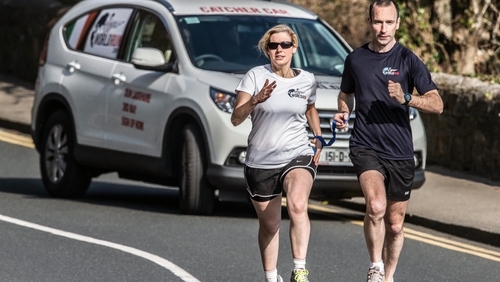 Kane from Cork, who is also a practicing solicitor, is legally blind and competes in events with the aid of a guide runner, another runner who is tethered to her by a cord running between their wrists. She has run in 24 races previously, in Finland and England, and had been hoping to use the 24 Hores d’Ultrafons en Pista in Barcelona on 15 December to gain a qualifying time and distance for next year’s IAU World Championships in France. I was very badly bullied through school, primary and secondary, so I am used to it, but that doesn’t stop it hurting when it happens. She was told by organisers that the race was sold out, but they added that she wouldn't be allowed to enter even if there was space due to her disability - a clear case of discrimination. "This is happening to me because no disabled athlete, male or female, has competed at world or European level in ultra marathon," said Kane, who was initially denied entry to the 2015 Women’s Mini Marathon in Dublin because her regular guide runner, John O’Regan, is a man. Organisers eventually backtracked and allowed her to compete. "I’m not surprised and I wouldn’t be surprised if it happened again. I’m used to it in my personal life - in my legal career I’ve applied for jobs and the employer has been keen but you can sense that once they see the white cane they get fearful. "I was very badly bullied through school so I am used to it, but that doesn’t stop it hurting when it happens." In 24-hour races athletes run as far as they can for a full day around a set course, often a standard 400m running track. They can take as many breaks as they want over the course of the day. Usually, quicker runners are accommodated in lane one, the inside lane, with slower runner and walkers in the outside lanes. "Sinead has participated in similar races in the past successfully and without causing any difficulty for the sighted participants. I would urge the governing bodies to re consider. Our own Minister for Sport might also make representations," said her solicitor, Ernest Cantillon. After repeated requests, and hiring a Cork-based solicitor, Kane received responses from the local event organisers, the International Association of Ultra-runners (IAU) - the sport's world governing body, and the IAAF - athletics’ world body. Kane said: "The race director makes out as if I am a poor blind girl just running around as opposed to an international competitor." In her first 24-hour race, she finished ninth female, covering 172km - that was competing against able-bodied athletes and included an hour out as she got treated for blisters, which reduced her overall distance. The local Barcelona organisers said in an email seen by RTÉ Sport: "Our ultra-races (24, 12 and 6 hours) are International competitions recognised by IAU awards. "Many athletes are coming from abroad to break national records and get good results to be qualified for other competitions. "The 24h and 12h participants run in only three lanes. This means 225 athletes running at different pace in a crowded track. "The act of running in parallel and by the hand of a guide means that overtaking can be complicated and can cause injuries that we prefer to avoid. "That's why unfortunately we cannot allow any couple running by the hand at these races. "Moreover IAU and IAAF regulations must be applied. Running in parallel by the hand could be considered ‘pacing', so your guide (the same one during the whole race) should be a woman, to be competing in the same race." The latter three points are incorrect; Kane and her guide don’t run ‘parallel by the hand’ and nowhere in the IAAF’s rules does it state that a guide runner has to be the same gender as the competing athlete, or that the same guide has to be used throughout a single event. Responding to a request for comment from RTÉ Sport, race organiser Jordi Monge insisted that this is not a case of discrimination - simply a health and safety issue due to limited space. He also points out that the race is primarily run to raise money for charity, including ONCE - a Spanish charity for the visually impaired. "We are a group of friends, athletics lovers, people with their own jobs, family and problems, who are working altruistically and for free since 15 years ago in order to collect money for charitable donations," said Monge. "For us, security for runners is obliged and unquestionable and we cannot accept guided runners in the same lanes than the other athletes due to our crowded races. "We are able to empathise with Sinead and applaud her courage and success but we feel sad and offended with her attitude toward us. "She has put us in a tough spot and we hope she can understand that our decisions will be always taken in the benefit of the whole competition and the charity, not for the personal wish of a single person." The IAU’s responded to Kane’s request to withdraw their support for the Barcelona event in future unless it welcomes disabled competitors by saying: "The labelling applications are based on certified course measurement and sanction from the national federation (or the ultra-running body member of the IAU). "Although IAAF policies are inclusive for all where possible they leave the race director/local organising committee bearing responsibility for their race course and whether the event can or cannot safely accommodate disabled athletes on the race course." The IAAF say they are unable to intervene in decisions made by respective governing bodies, in this case the IAU. However, the IAAF did encourage Kane to take up an IAU offer of a place on a new committee to improve inclusivity at their events. "Currently, we do not have policies and procedures in place to safeguard and reflect the needs of our disabled athletes," said the IAU’s Director of Communications Nadeem Khan in an email seen by RTÉ Sport. "In order to do so we are taking steps in putting together a committee to primarily look into the needs of our disabled athletes. We would welcome you to be a member of this committee and lay down the foundations for the polices that will lead us into the next several years." When contacted by RTÉ Sport via email, Kahn insisted that Kane's exclusion was on health and safety grounds, adding: "We are and never will be proponents of any form of discrimination. "Nor do we support any such discrimination. It is clearly stated in our mission statements. Hence, we are forming this committee which Sinead is interested in being a member to address any concerns athletes might have." Kane responded by saying: "It’s all fine being on a committee. Okay, they want to make change and they are asking for my views. "But that doesn’t deal with the current issue - they are putting the responsibility on me rather than trying to deal with it." Kane now plans to enter the two 24-hour events she has run before, in Finland and England, next year in the hope of qualifying for the 2019 worlds in France. She says the organisers of both races couldn’t have been more accommodating of her and her guide runner. "The race in Finland in February 2017, when I entered the organisers said that they were going to need to take direction from me," she said. "They had been organising the race for ten years and never had a runner with a disability. "I just told them that they would just need to allow me to use a guide runner and that I would respect all of their rules."